Living The Life: Looking Pretty! Molly is such a cutie pie. Molly is my friend and coworker's daugther (Cathy). Today at school Cathy took over 1000 pictures (just kidding). Cathy took alot of great pictures today. 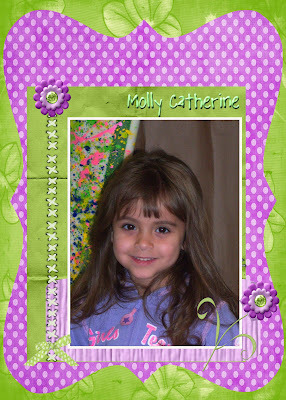 I just love this picture of Molly she is so beautiful. Of course I had to create a quick layout for such an amazing picture (5x7).